Small Caps Are Rising. Biotech Stocks Can’t Be Far Behind! While much attention is being riveted on the S&P 500 new all-time high eclipsing the January one, small caps accomplished that in May. Small caps are in their next leg up as they record new all-time highs, once again leading the broader indexes. Biotech stocks, dominated by small and midcaps, have been closely tracking small cap index performance. As of Sep 1, the Russell 2000 was up +14%, and the Nasdaq Biotech Index up +15%. The Graycell Small Cap was up +48%, & the Prudent Biotech Portfolio up +75% for the same period. Waiting for a Correction is hurting the portfolio performance for many investors including smart money. Stocks are now once again demonstrating upward momentum. The S&P 500 has finally emerged from its 7-month consolidation as it weaves its way back to chalking all-time highs. 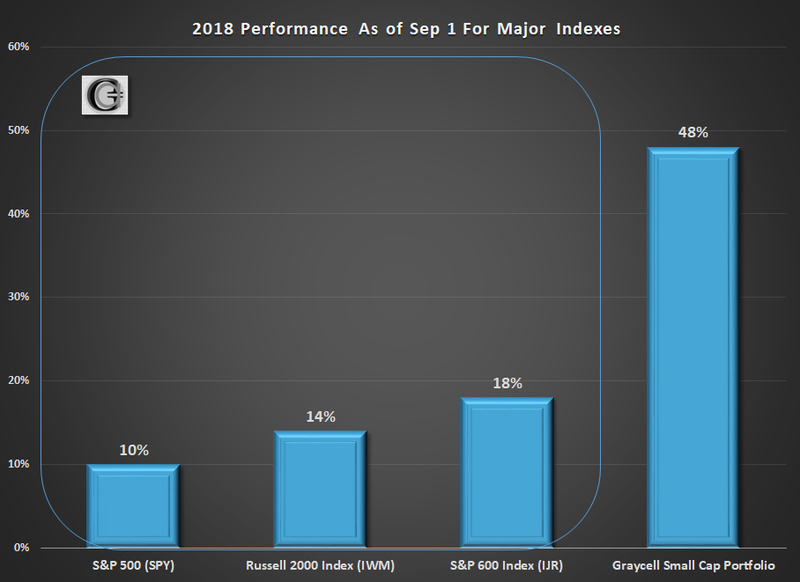 While that is an event worth acknowledging, it may not as breathless a milestone when one realizes that the small cap Russell 2000 index led the market and achieved that milestone in May, followed by a similar achievement by the Nasdaq Composite in June. 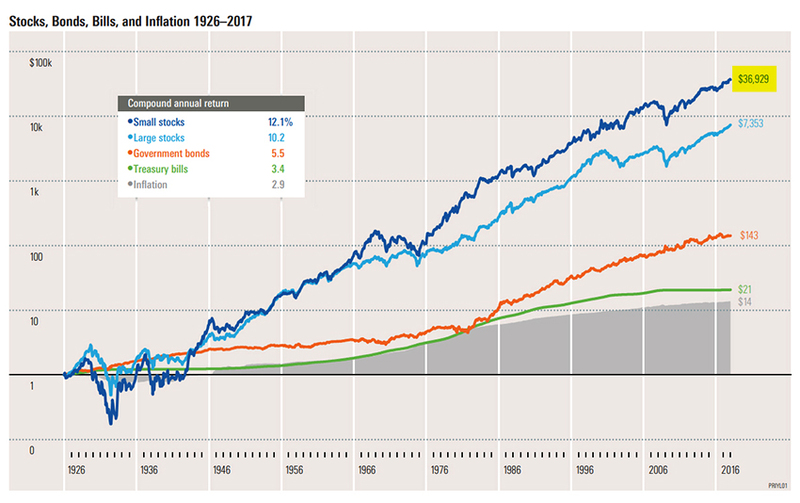 However, what may be an even more meaningful milestone is that small caps are once again leading the broader market to all-time highs, and we are now in a position to have all three major indexes - S&P 500, Nasdaq, and Russell 2000 - recording new highs concurrently. Such an event doesn't harbor an imminent Correction but instead is more suggestive of further gains. The exercise of predicting market corrections, pullbacks of 10% or more, is, for the most part, a highly difficult and often times a futile and costly exercise. Many Corrections provide poor visibility and occur so fast and sharp that investors are well into the midst of one in a matter of days, before realizing what they're encountering. Relatively speaking, it may be a less onerous task to predict bear markets than to predict Corrections. 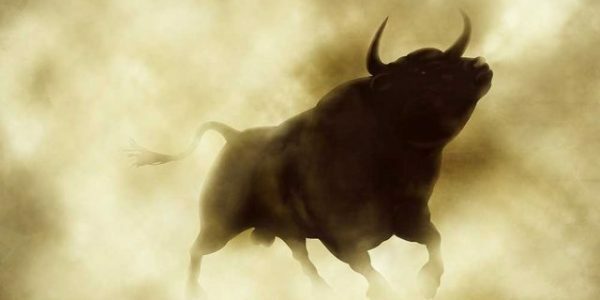 Recently, the bull market entered its longest cycle ever as it crossed 3452 days, eclipsing the previous record set from October 1990 to March 2000. Although, perhaps, the earlier record may have been much longer. A bull doesn't die of old age. Longevity by itself doesn't halt a bull market, although it continues to raise the probability that a mature economic expansion is closer to the end. Eventually, it's the declining state of economic affairs or a systemic shock, which are the death knell for a bull market. What has been the hallmark of this expansion is that 3,450 days later, there is no prominent excess or significant frothiness in the market. A simple metric, the price-to-earnings ratio, of 17x forward 12-month earnings for S&P 500 companies, is near the 5-year average of 16.3x, as per Factset, and not at a telltale level betraying a euphoric state of affairs. In fact, a healthy dose of investor skepticism and concern exist as investors fret about overvaluation and the end of the bull market. Typically, in such situations, with the economy remaining robust, the markets continue to climb the proverbial wall-of-worries. 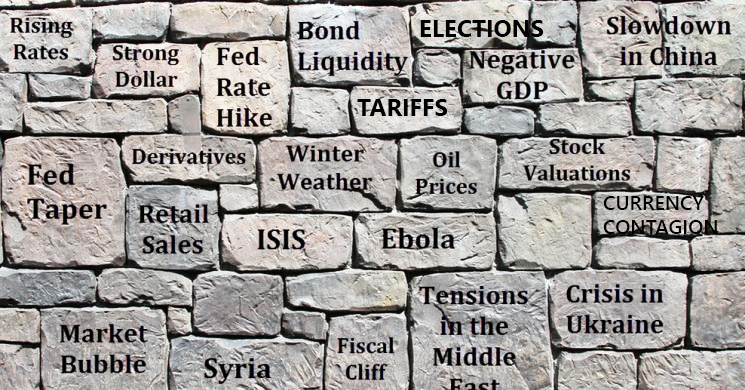 And the wall-of-worries will only rise higher now that we have achieved the mantle of the longest bull market. The US is the only major economy that is showing robust economic growth, in contrast to Eurozone, China, Japan, and emerging markets as a group. As the divergence persists, it will continue to attract further liquidity into the US stock market. Investor skepticism is evident in the fact that not all investors are participating in the mega bull market. Some are left on the sidelines this year as they continue to wait for the next Correction. Between mid-March and July, investors withdrew nearly $40 billion from equity funds, while investing nearly $80 billion in the perceived safety of bond funds, as per Bespoke Investment Group. Well, bonds are a safe haven in a crisis, but they may not prove to be as safe and desirable an investment in a growth market, where inflation is perking up. Many others have simply not participated as a result of the vicious financial crisis of 2007-08 seared into their memories. Individuals who used to be for the most part middle-class investors have sat out, anchored to the memories of the Great Recession. This has resulted in a growing concentration of wealth amongst the top households in the country. According to research conducted by Edward Wolff, an economics professor at New York University, the share of the American households invested in the stock market is still well below the levels prevailing before the financial crisis in 2007. At the same time, Wolff estimates, share-ownership concentration has increased with 10% of households owning 84% of the value of shares in 2016, up from 81% in 2007. The concentration has only increased further, after the strong market rise in 2017, to nearly 90%. Even the smart money, as professional money managers and hedge funds are referred to, has been caught flat-footed this year. As per a Bloomberg analysis of the Hedge Fund Research Data, an index tracking the performance of such funds has fallen in 5 of the last 6 weeks, wiping out the gains for the year. The net leverage ratio, a measure of risk appetite among hedge funds, has fallen to the lowest level this year. For hedge funds have been waiting for that elusive Correction as well and were net-short as they reduced the long position. Smart money may still be right eventually and a Correction will occur. But the poor recent performance shows the difficulty of predicting and timing Corrections even for smart money. There are a number of market unknowns like the trade tensions with China and EU, the North Korean crisis, the teetering Turkish economy, the emerging market turmoil, the Mueller investigation, etc. But these are, what can be referred to in former Defense Secretary Donald Rumsfeld's terminology, the "known unknowns," and have existed for some time. As long as the economy remains robust and the monetary policy cautious, the stock market will continue to operate in a favorable environment. A focus on determining the beginning of a bear market, which in itself is hard enough to predict and dramatically erodes investment wealth, can be a more fruitful and meaningful exercise, than anticipating the next whimsical correction, which is a mere dip in an overarching Bull market. Even though there is a mist of uneasiness and a never-ending fear of a pullback, the stock market continues to show a propensity to move higher. A lot of things have to be right when small caps are leading - the economy, the interest rates, the earnings, and a risk-on environment. For long-term investors, small cap has been an investment class of choice due to its consistent record of outperformance over time. Size or market cap is an important factor affecting total returns. Over the period shown above, small caps have performed over 5x better than the next class, the large-cap stocks. The persistence outperformance of small caps over an extended period of time is also prevalent over relatively shorter timeframes, like the 20-year period with two punishing economic recessions. The performance of small caps this year has been propelled by a variety of reasons, primary among them being the underlying strength of the economy. A strong domestic economy assists all US corporates, but more so the smaller caps which have a higher concentration of domestic revenues. In an environment of stellar earnings growth, strong consumer and business confidence, and a supportive monetary policy, it is natural for financial risk-appetite to grow and finds opportunities where the probability of returns are higher. Can Biotechs Stocks Be Far Behind? A favorable environment for risk is assisting small cap stocks to rise to record highs. In such an environment, biotechs stocks can't be far behind. Small caps and biotech stocks have demonstrated a high correlation due to their speculative and high-risk nature. 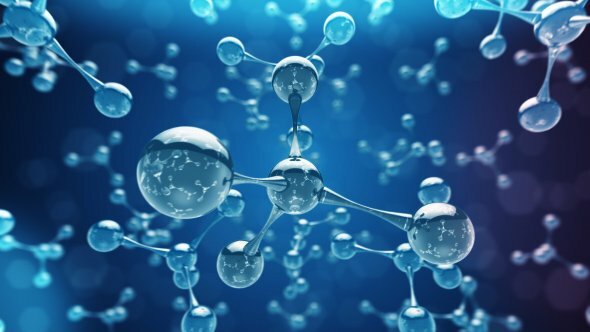 With the smallcap Russell 2000 index breaking new ground, it is just a matter of time before the S&P Biotech Select Index (XBI) records its own new all-time high. The larger cap weighted Nasdaq Biotechnology Index (IBB) will also be recording 52-week highs, though it still has to move another 12% to eclipse the all-time high set in July 2015. Even the broader pharmaceutical industry has been performing quite well with major stocks like Pfizer (PFE), Merck (MRK), and Eli Lilly (LLY) recording new highs. One would believe this will bode well for further biotech M&A activity. However, there are some unique concerns which affect the biopharma sector. Rising drug prices remain a nagging issue, and even though recent efforts, like the blueprint American Patients First, have been industry benign, the issue is bound to resurface strongly during the political rhetoric leading up to the November elections. Thus far, major pharmaceuticals like Pfizer, Merck, Bristol Myers Squibb (BMY), Johnson and Johnson (JNJ), and Novartis (NVS), amongst others, have committed to not raising prices till year-end, while still maintaining guidance. Also, there were no major formulary exclusions by the three major pharmacy benefit managers (PBMs) Express Scripts (ESRX), CVS Health (CVS), and OptumRx of UnitedHealth Group (UHS), which has improved the sentiment on the pharma sector. But the pressure on drug prices is there and will persist. The Health and Human Services Secretary, Alex Azar, has been pushing for bigger rebates and leaning heavily on middlemen PBMs to lower the drug prices. In the meantime, the States are raising the pressure on pharmaceutical companies, making them disclose and justify the price increases. Thus far in 2018, there have been 24 states that have passed bills to curb prescription drug price increases, as per the National Academy for State Health Policy. A growing number of states for the first time are trying to regulate the middlemen PBMs, requiring them to disclose the rebates and price concessions they receive from drug companies. In all likelihood, the possibility of a significant policy change, even from a change in control of Congress, is limited, unless the President decides to work with the Democrats and sign such legislation. In case there is no change in control of either chamber of Congress, it can be considered a net positive as it extends the status quo. Nonetheless, the drug pricing environment for biopharma will remain tense and can adversely affect sentiment during the fourth quarter. There is a growing dispersion in stock returns as the group of losers is just as wide as the group of winners. 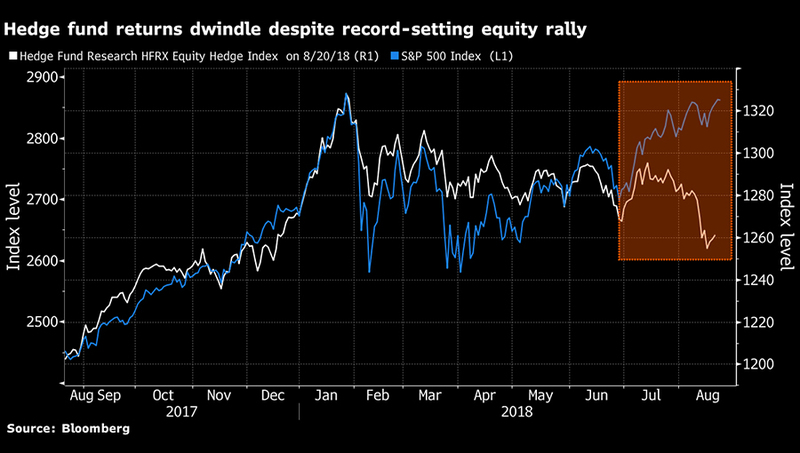 The rising tide lifts all boat approach is working less effectively this year as the market is shifting toward stock-picking. 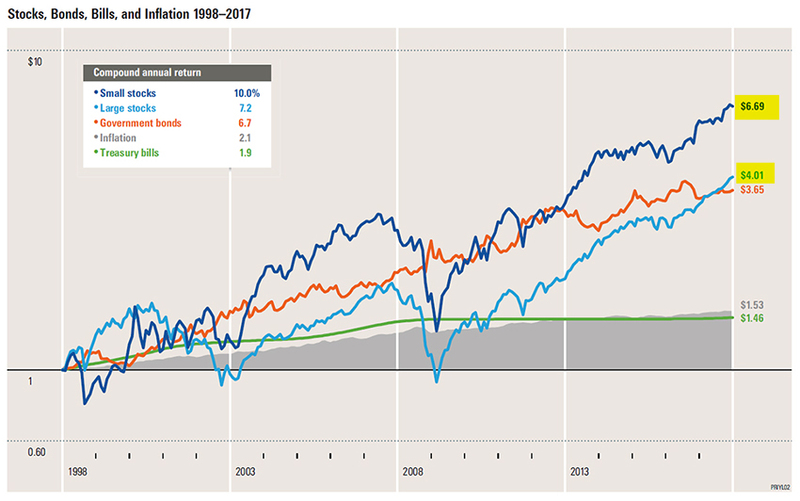 The importance of being in the right stocks has assumed greater importance as the dispersion or spread in equity returns has widened to levels not seen since the start of the bull market. This year the top 24 performing industries in the S&P 500 have outperformed the worst by nearly 49%, according to Bloomberg. Such a high dispersion or gap in performance was last seen in 2009. The market is becoming quite selective. The market is a tricky beast, and it's not easy to predict short-term turning points. As the Summer winds down and investors return in September, they will be encountering legitimate concerns. Some of these include the sustainability of second-half profit growth as the impact from a tax boost fades, and the sustainability of GDP growth beyond 3%, amongst others. With indexes at all-time highs, one can find reasons to expect volatility or a short-term pullback near-term. We had discussed the second-half outlook in greater detail in an earlier article, What Now After Double-Digit Gains. Investors have seen the benefit of staying the course for much of the year and the underlying market strength is hard to question. It may be prudent to continue positioning the portfolio based on market evidence. 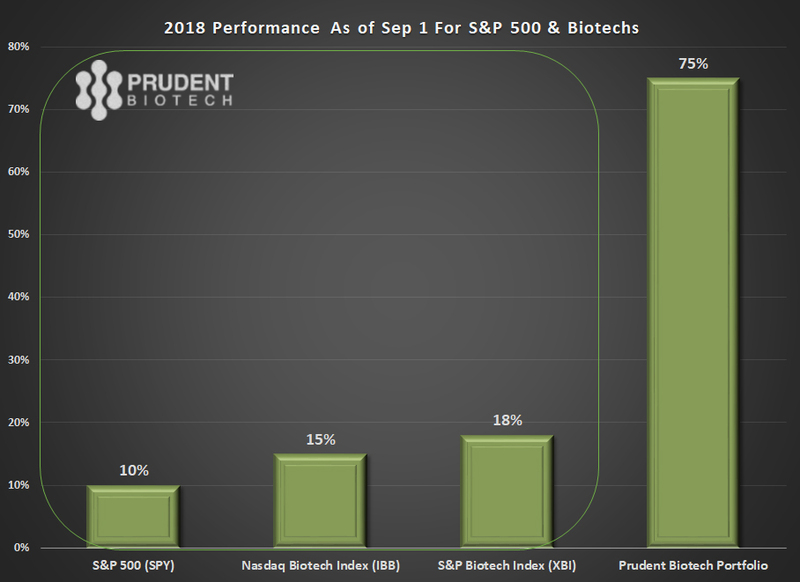 The Prudent Biotech Portfolio had gained +75% and the Graycell Small Cap gained +48% as of Sep 1, and we believe a tilt towards small and midcap stocks remains an attractive investment opportunity. There are many promising small cap stocks as well as biotech stocks across the market cap spectrum that have been doing well and a few of them include, Ligand Pharmaceuticals (LGND), Biogen (BIIB), Vertex Pharmaceuticals (VRTX), Regenxbio (RGNX), Sarepta Therapeutics (SRPT), Reata Pharma (RETA), Verastem (VSTM), Endocyte (ECYT), Heron Therapeutics (HRTX), Arrowhead Pharmaceuticals (ARWR), Affymed (AFMD), Endo International (ENDP), Intercept Pharmaceuticals (ICPT), Mirati Therapeutics (MRTX), Viking Therapeutics (VKTX), Acceleron Pharma (XLRN), Neurocrine Biosciences (NBIX), Immunomedics (IMMU), Tandem Diabetes (TNDM), Renewable Energy (REGI), Natera (NTRA), Turtle Beach (HEAR), Funko (FNKO), Mallinckrodt (MNK), Invitae (NVTA), and TransEnterix (TRXC).